Choreographer Chris Tucker, in collaboration with Brenna Pierson-Tucker opened the evening with a trio exploring the relationship between innovators and those left behind in the wake of progress. Lights came up on a trio of dancers stacked neatly atop one another, the way you might stack coffee creamer pods at your local diner. This was the first of many striking architectural forms that the dancers would create throughout the evening. The trio of dancers eventually dissolved into a duet, danced by Allie Buchweitz and Rebecca Robertstad-Hernandez. which utilized unison and mirrored movement to emphasize the camaraderie and compatibility of the two. Before long, the stage emptied, only to be filled by the loneliness of a solo danced by Cayla Roberts. Lights came up on a trio of dancers stacked neatly atop one another, the way you might stack coffee creamer pods at your local diner. This was the first of many striking architectural forms that the dancers would create. 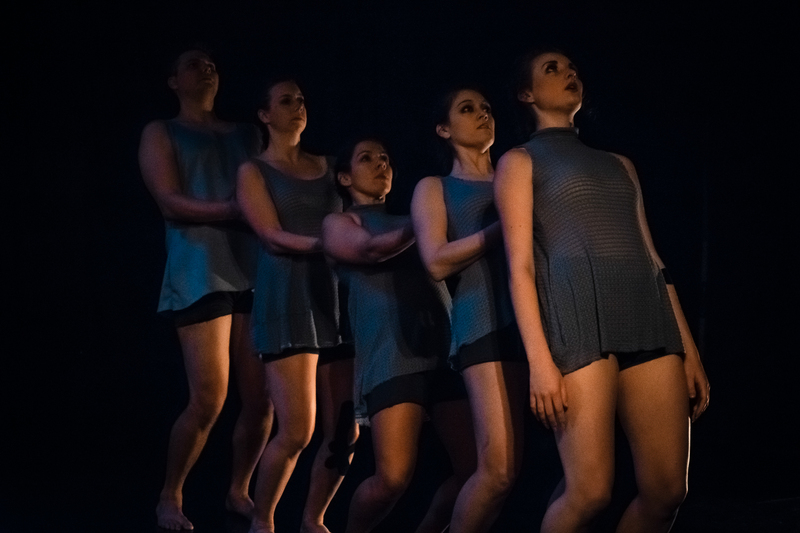 What stood out most in this piece was the choreographic challenges presented to the dancers. Part of Esoteric Dance Project’s mission is to provide technique-based education in modern dance, which is demonstrated through the complexity of the partnering that Chris took the lead in creating. Dancers were challenged with partnering in the form of unconventional weight sharing, using different surfaces of other’s bodies as substitutes for their own limbs or for additional support, as depicted above. It was refreshing and impressive to see Brenna partner Chris as equally as Chris partnered Brenna (especially considering their height difference, which looked to be about a foot). The second piece in the program was danced and choreographed by spouses and co-founders Brenna and Chris. The program notes that this piece is “an intimate exploration into the sixteen-years (they) have been together”, and the movement they created proves that their relationship is one that is sure to last. The two dancers began on stage with lighting that resembled twilight, created by lighting designer Brian Elston. In the calm of this dim light, Brenna and Chris danced through a pattern lying on the floor – the most elegant,pleasant, and comforting version of a couple sleeping side by side you could imagine. As they began to make their way up from the floor, the weight sharing that they introduced on the floor evolved. It was refreshing and impressive to see Brenna partner Chris as equally as Chris partnered Brenna (especially considering their height difference, which looked to be about a foot). As I took in the choreography for this piece, I was struck by the staging, especially towards the second half of the piece. I was reminded of my college composition class, where I learned classic techniques of choreography. The geometric patterning and structural play of the space represented the sleeping patterns that Brenna and Chris have developed throughout their time together, and also served as a demonstration of a choreographic technique of modern dance for the audience. 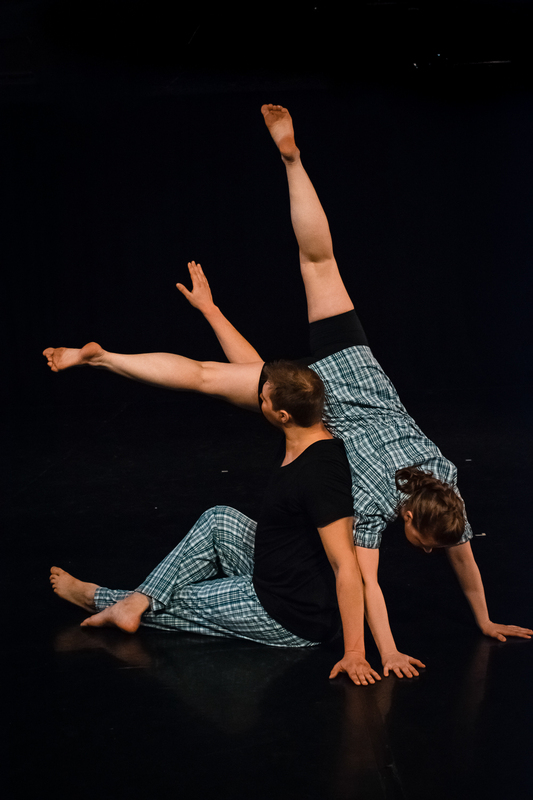 The geometric patterning and structural play of the space represented the sleeping patterns that Brenna and Chris have developed throughout their time together, and also served as a demonstration of a choreographic technique of modern dance for the audience. If you have ever experienced pain or injury, this is a piece that you can connect to. This deeply emotional work asked the dancers to be at their most vulnerable and literally share the history of their injuries with the audience. Each of the five dancers had kinesiology tape indicating an area of past injury, and had a specific movement gesture inspired by that injury. Eventually, the five dancers formed a circle, and one by one, took to the center to tell the audience the nature of their ailment – everything from ruptured discs to degenerative disease. I am a professional dancer myself, and sustained a severe joint injury early this year. This piece struck a chord with me, and made me reflect on my own reluctance to talk about my injury and progress in detail. I must applaud each of the dancers for their bravery and vulnerability in sharing their stories. Creating dance around career-changing injuries put this cast face to face with their trauma, but also allowed them to see how far they had come, both in mind and body. There is no doubt in my mind that the dancers in this piece went through a therapeutic process during its creation. Creating dance around career-changing injuries put this cast face to face with their trauma, but also allowed them to see how far they had come, both in mind and body. Dance can be a powerful tool for self-discovery and growth, and the dancers of Esoteric harnessed it to inspire their audience.